Food is such an important aspect of any wedding in Spain, which is also one of the major factors a bride and groom considers when choosing to get married in Spain. With an eclectic mix of Spanish food available throughout the country, from mainland Spain to the Balearic islands, there are various styles you can choose from to add to your theme for your wedding in Spain. Firstly when you have decided on your chosen Spanish wedding destination take some time to understand the local food and produce, you might find some local delicacy that you could add to your menu to bring your Spanish theme to life. Think about the venue you have chosen and consider the type of food available and what would best suit your location, if you are getting married in Spain by the sea then it would be wonderful to have some fresh fish served for one of the courses. These decisions do not have to be made solely by yourself, your wedding planner in Spain should help to guide you through the process and liaise with either your wedding venue in Spain, if they are providing the catering, or to your wedding caterers in Spain who should be able to offer an array of interesting concepts to add to your wedding in Spain. Due to the temperature at your wedding in Spain, bridal couples like to offer a combination of water, beer and soft drinks. Some only serve water, it is up to the individual bride and groom and their budget. Aperitifs are served, which could be a mixture of champagne Cava, Cocktails, Sangria, which is a local drink served in Spain, soft drinks and water. At this point light finger food; hot and cold canapés, can be served comprising of 4-12 pieces per person and can be created by your wedding cater in Spain or the hotel chef. Buffet – A buffet style offers guests a collection of different dishes to choose from which provides the opportunity for you to taste an array of styles and combinations, all beautifully put together and presented on stunning decorative food stations. Gala Dinner – This service normally comprises of a minimum of 3 courses where your wedding venue in Spain, or your wedding caterers in Spain, will come up with various courses and food combinations to the individual taste of the bridal party. Dinner will be served at the tables via a waiter. When choosing your food combinations, your caterers in Spain will normally have a number of example menu’s to help guide you and which can be amended to your personal taste. All the above types of food options would include a dessert and some a wedding cake unless you have decided on using a separate bakery. During dinner wine and water will be served; you would be asked to choose from a selection of wines to be served for your guests and would request that guests are invited to have soft drinks during these courses also. As your guest have flown from various places to be at your wedding in Spain, and you want to celebrate with them after the food has finished and the dancing starts, you would provide an open bar. Here you can agree on what drinks are included in the open bar which is normally a minimum of 2 hours upwards. Some bride and grooms like to offer their guests a snack, a few hours after dinner, which often helps keep the party going and the drink flowing for everyone to enjoy so they can make the most of being at a wedding in Spain. 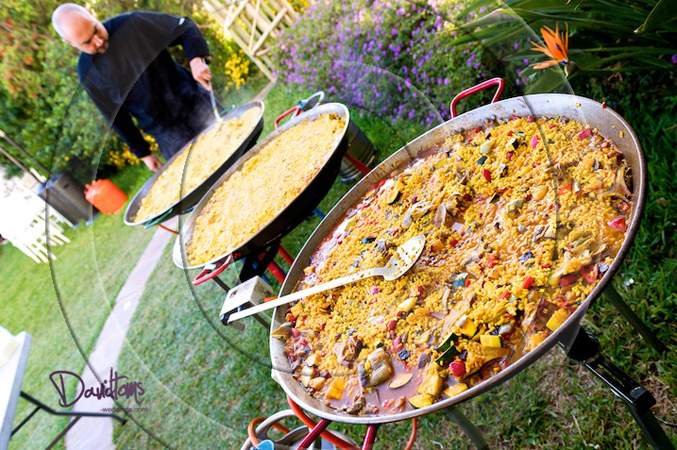 Food is such an important part of any wedding and especially if you are getting married in Spain. You have chosen a wedding destination that is passionate about its food and cooking and where your guests will be delighted by the quality, taste and combinations that will be created and presented to them. If you love food, love Spain and love the warm weather then speak to one of our wedding planners in Spain today who can help you to make your wedding vision come to life!